In short, water is vital. 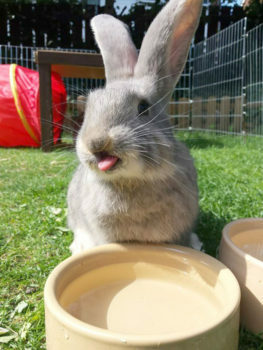 Rabbits must have access to plenty of fresh water at all times. Rabbits eating lots of fresh grass and greens will drink less, whilst those eating mostly hay will drink more. Bowls will not get blocked, but they may get spilled or knocked over so it’s a good idea to provide a bowl and a bottle if you can. Change the water in both daily, clean them regularly and keep them free of any slime or debris. It has four main functions, all of them absolutely essential. Let’s look at those last two functions in particular. The digestive system only works properly when it is well-hydrated. Ingested food must be kept moist to allow it to move freely through the system. If it gets too dry it will block the gut and that leads to a very serious problem called Gastro-Intestinal Stasis or Ileus. The longer the ingested contents sit in the large intestine (colon), more water will be drawn out of the intestines and into the blood stream. This leads to more dehydration of the contents adding to the blockage, so delay in treatment can really add to the problem. When this is happening your rabbit will produce no droppings or only very small, hard ones and he’ll have no appetite. It’s life-threatening and you must get your rabbit to a rabbit-savvy vet immediately. Unlike humans, rabbits’ bodies absorb every bit of calcium from their food. They do need a lot to keep bones strong and teeth growing, but not as much as they absorb. Any they don’t need will pass out in their urine, which is why rabbit urine can often be chalky. Too much or too little calcium can cause problems. Too little is linked with dental disease, whilst too much calcium causes urinary stones and bladder problems. Water is essential for making sure that what they don’t need is flushed through the kidneys and bladder. 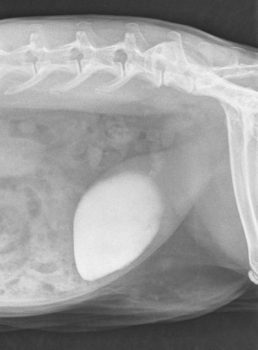 If it builds up, they can get bladder sludge, bladder stones or kidney stones. These are very serious conditions and avoiding them is better and far more successful than trying to fix them once they’ve occurred. The level of calcium in urine will vary depending on your rabbits’ overall diets – ask your rabbit-savvy vet for advice if you are concerned about too much or too little calcium. If you see your rabbit drinking more than usual, it can be a sign that he’s in pain or very stressed. Check that nothing in their home is causing them to be upset, such as foxes visiting your garden and ask your rabbit-savvy vet to check for any health problems.